When an organism dies, such as the pictured American Toad, a series of decomposers appear and break it down. Some of the first insects to arrive at the scene are blowflies, and they lose no time in laying eggs which rapidly hatch into larvae, or maggots. A bit later, carrion beetles move in. Both of these insects live in dead carcasses, where they eat raw flesh and fungi. 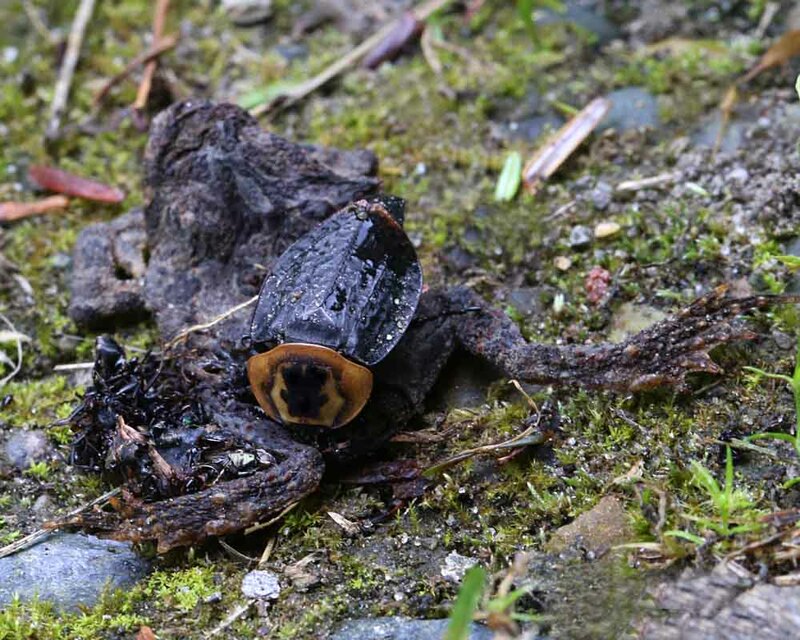 There is great competition, believe it or not, for rotting bodies, and carrion beetles such as the pictured American Carrion Beetle (Necrophila americana) have managed to find a way to eliminate some of it. They carry tiny mites on their backs which travel from carcass to carcass with the beetles, devouring the eggs of maggots as well as the smallest maggots themselves. In addition, carrion beetles secrete a strong offensive odor that irritates other insects and predators, a second effective way to reduce the number of insects competing for a corpse.